Hi there! Today I’m sharing a review for a recently published M/M contemporary police romance from Kate Sherwood. 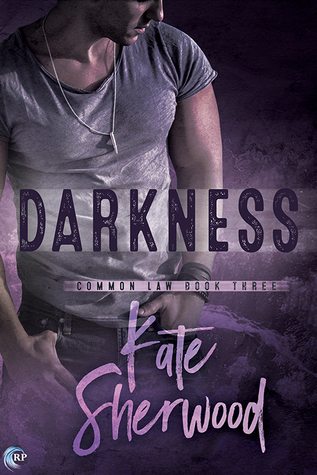 DARKNESS is the third book in her Common Law series, and was a fab follow up to LONG SHADOWS and EMBERS. This small-town epic is tense and filled with intrigue between local law enforcement, federal agents, friends, neighbors and criminals. This is the third book in a series and best enjoyed when read in order. Jericho Crewe is still working as Undersheriff in his small border hometown of Mosely, Montana. It’s only been a few months since his return and everything’s been mostly a mess. His father’s murder is still unsolved, though Jericho isn’t losing too much sleep over taht fact. He held no love for his abusive, criminal, estranged father. Learning he has two half-siblings has been a trip, and tangling with his shady step-mother and even shadier ex-boyfriend, Wade Granger, has been an exercise in minefield transit. This time, however, Jericho’s unwilling to hide his relationship with Wade from those who matter–and he’s tired of worrying that the Feds who have a constant tap on Wade’s phone lines will out him. Besides, his boss knows all about Jericho and Wade’s complicated history. The police work in this book doesn’t involve Wade or smuggling. A local prostitute has been murdered, and all the evidence–a whole lot of it in fact–seems to point toward a local brain-damaged man. Will Archer went to high school with Jericho and Wade. He was injured in a car wreck and has been largely non-verbal since. How this gentle man could be responsible for the violence at the crime scene Jericho can’t fathom. And, the investigation leads to an outsider to town, a man who seems particularly interested in the case, and peculiarly aware of the details not released. I really liked how Jericho worked through the angles of this case, and how he kept looking for the truth, even though it was super hard to find. It was also an interesting look at small town justice, and how dedicated some law enforcement officers are to doing their job right–people beyond Jericho, btw. It always strikes me that Jericho has such a sense of right v. wrong, and yet is startlingly in love with Wade Granger, the (alleged) definition of a career criminal. This book really does draw their romance into the open, and causes issues for Jericho and his job–though he’s getting worn out as an undersheriff and is open to exploring his career opportunities yet again. I’m anxious to pick up the fourth book in this series and see how Jericho reconciles his open love for Wade, and his life in Mosely. Interested? You can find DARKNESS on Goodreads, Riptide Books, Amazon, Barnes & Noble iTunes, and Kobo. I received a review copy of this book via NetGalley. Catch up with Kat on her website, Facebook and twitter.